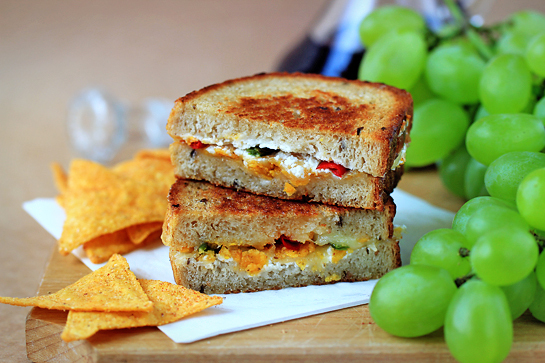 Grilled cheese sandwich is a wonderful thing. In my world, it definitely is so. Grilled cheese sandwich means comfort. 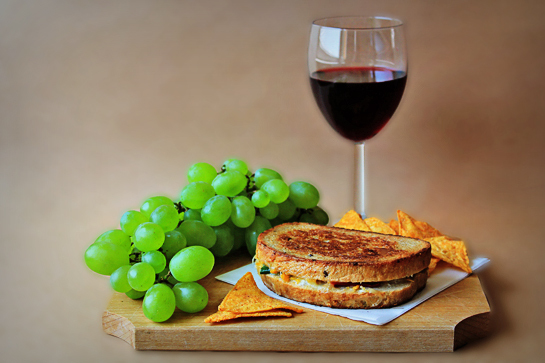 Grilled cheese sandwich means a piece of home that you can take wherever you go. 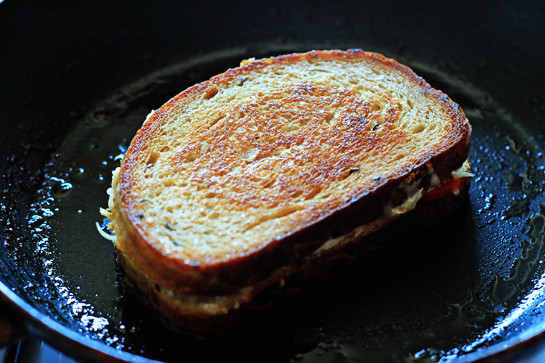 Grilled cheese sandwich means simple perfection. 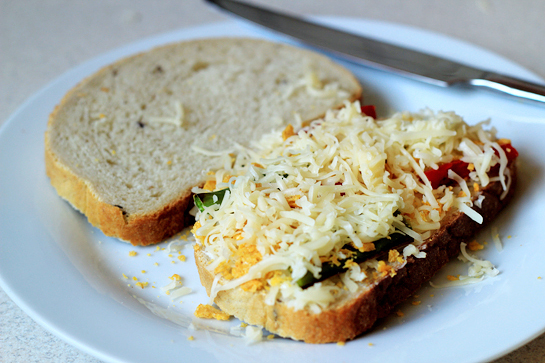 The grilled cheese sandwich I am going to show you might be slightly different from a typical one, but man, is it good. There’s a chili pepper for a nice punch, there’s cream cheese for more creaminess and flavor, and there are crumbled tortilla chips inside for some special extra crunch. To prepare one (1) sandwich, you will need these ingredients. 1. First, wash, dry, cut in half lengthwise, and seed one chili pepper. 2. Place the pepper on a hot pan and roast it for about 8 minutes, until it gets softer. If brown spots appear on the pepper as it roasts, that’s okay. 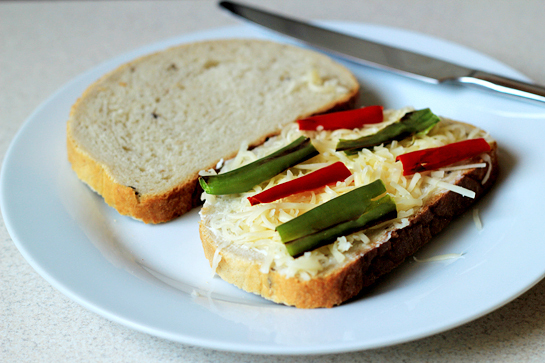 Just remove the spots with a knife before assembling the sandwich. You can use any cheese you like. 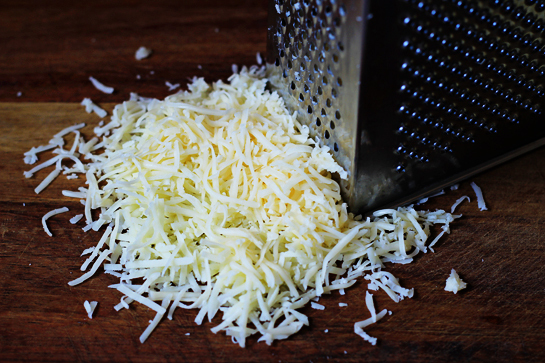 I am using a very pale colored kind of cheddar here. 4. 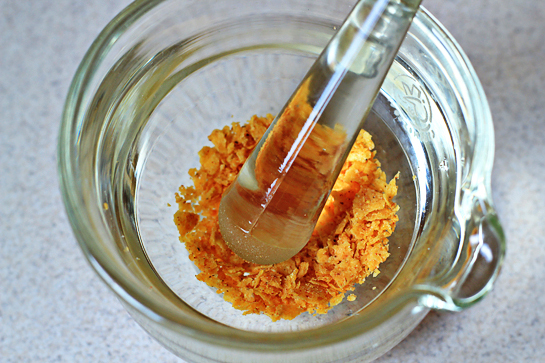 Crumble the tortilla chips. These are barbecue flavored. Yum! 5. And now we can assemble the sandwich. 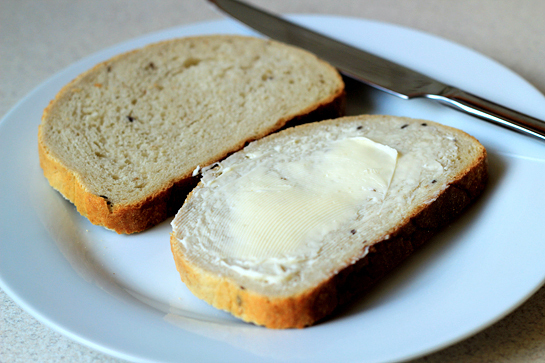 Spread 1 tbsp butter on one of the bread slices. 6. Add half the amount of cheese. 8. Add the tortilla chips crumbs. 9. Then add the rest of the cheese. 10. 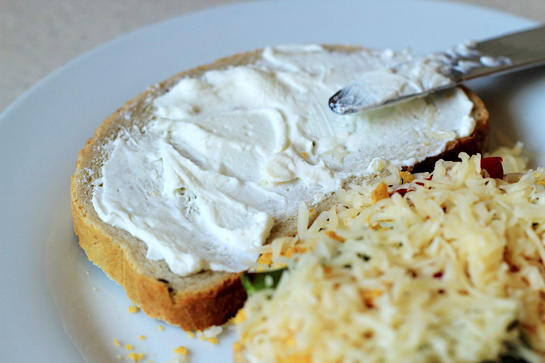 Spread 1 tbsp cream cheese on the other slice of bread. 11. And put the slices together. 12. In a medium pan, melt 1 tbsp butter. 13. 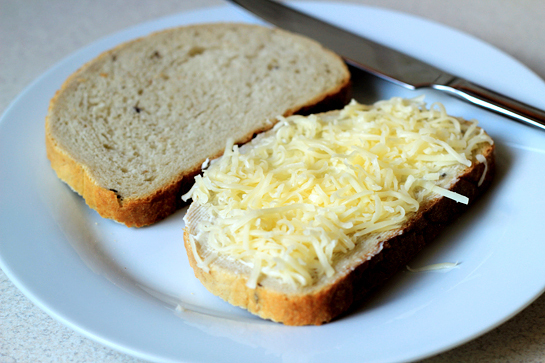 Place the sandwich in the pan and grill until golden brown and the cheese has melted, about 2-3 minutes per side. Gently move the sandwich around to allow the butter to soak into the bread. 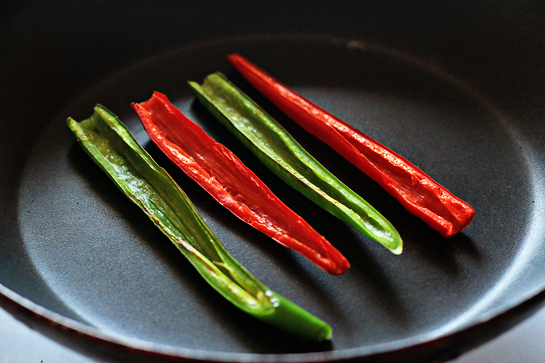 That is the sexiest photo of peppers I have ever seen (or will probably ever see). Grilled cheese is one of my favorite standby meals, when I can’t think of anything else to make. Now I have the perfect way to doctor it up! As someone who has an unhealthy obsession with the grilled cheese sandwich, I must say that this particular grilled cheese looks absolutely delicious. The photos, especially the last one, are awesome. I will definitely have to try this. 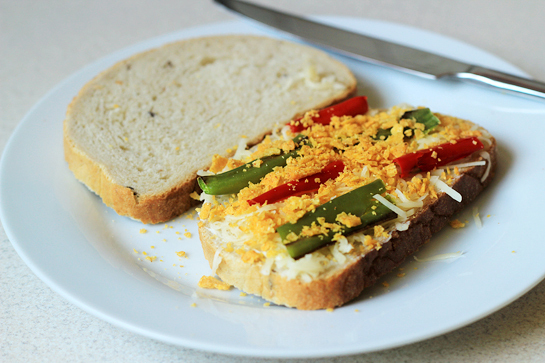 Tortilla chips is an interested crunchy twist to the sandwich. Nice addition! I might have to use pepperjack cheese for extra spice! 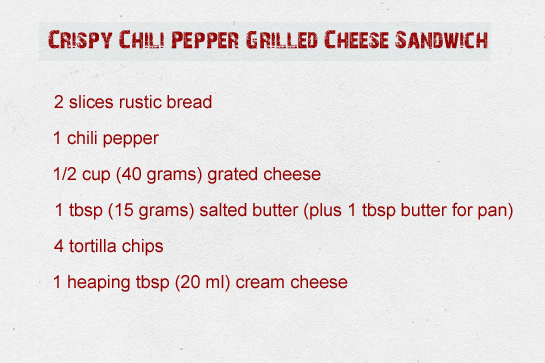 A grilled cheese is absolutely a wonderful thing, and yours is enticing with the peppers and crumbled tortilla chips. Thanks! 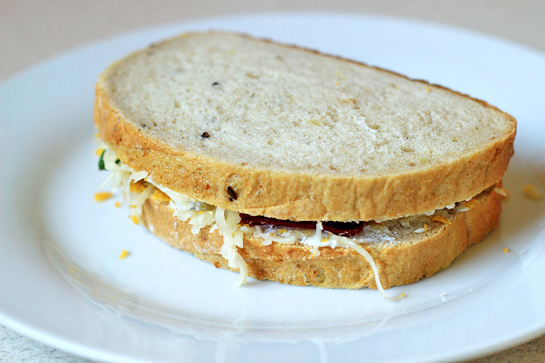 I cooked this sandwich a few days ago at home using Spanish cheese as it was the only one I had at home, I have to say it was awesome, it really improved the taste, why donÂ´t you give it a try?, just have a look at this website which I find very interesting. Just made these for the family. Smash hit! !